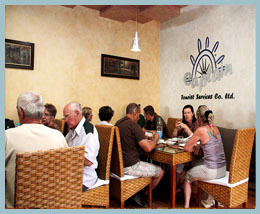 With its small welcoming atmosphere Captain's restaurant welcomes up to 200 guests in its pleasant indoor venue. The restaurant offers an all day dining experience – a la carte, indulging the day with the finest selection of Oriental and Traditional meals and spectacular sea food cuisine. Copyright © 2013 Captain's Restaurant - All rights reserved.